I recently came across this Pen and my first thought was that it could all be done with just three elements: a wrapper, a range input and an output. On the CSS side, this involves using a conic-gradient() with a stop set to a CSS variable. 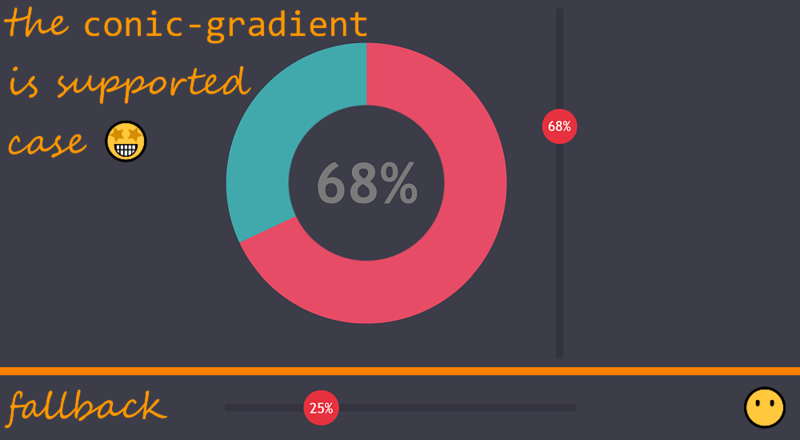 In mid 2015, Lea Verou unveiled a polyfill for conic-gradient() during a conference talk where she demoed how they can be used for creating pie charts. This polyfill is great for getting started to play with conic-gradient(), as it allows us to use them to build stuff that works across the board. Sadly, it doesn't work with CSS variables and CSS variables have become a key component of writing efficient code these days. Alright, now we can get started! If our browser supports conic-gradient(), the wrapper gets a class of .full and we style the output into a chart. Otherwise, we just have a simple slider without a chart, the output being on the slider thumb. The result in browsers supporting conic-gradient() (top) and the fallback in browsers not supporting it (bottom). Before anything else, we want to show a nice-looking slider on the screen in all browsers. If you need a refresher on how sliders and their components work in various browsers, check out my detailed article on understanding the range input. We can now move on to the more interesting part. We decide upon the dimensions of the track and thumb and set these on the slider components via the corresponding mixins. We'll also include some background values so that we have something visible on the screen as well as a border-radius to prettify things. For both components, we also reset the border to none so that we have consistent results across the board. We start by getting the slider and the wrapper and creating the output element. We put things in motion by calling the update() function, adding the output to the DOM as a child of the wrapper and then testing whether the computed background-image of the output is the conic-gradient() we have set or not (note that we need to add it to the DOM before we do this). If the computed background-image is not "none" (as it is the case if we have no native conic-gradient() support), then we add a full class on the wrapper. We also connect the output to the range input via a for attribute. Via event listeners, we ensure the update() function is called every time we move the slider thumb. We've also given the output a light color value so that we can see it better and added a % at the end via the ::after pseudo-element. We've also hidden the tooltip (::-ms-tooltip) in Edge by setting its display to none. If you need a refresher on how align-items and justify-content work, check out this comprehensive article on CSS alignment by Patrick Brosset. This is starting to look like something, but our output isn't moving with the slider thumb. In order to fix this problem, let's first remember how the motion of a slider thumb works. In Chrome, the border-box of the thumb moves within the limits of the track's content-box, while in Firefox and Edge, the thumb's border-box moves within the limits of the actual slider's content-box. While this inconsistency may cause problems in some situations, our use case here is a simple one. We don't have margins, paddings or borders on the slider or on its components, so the three boxes (content-box, padding-box and border-box) coincide with both the slider itself and its track and thumb components. Furthermore, the width of the three boxes of the actual input coincides with the width of the three boxes of its track. 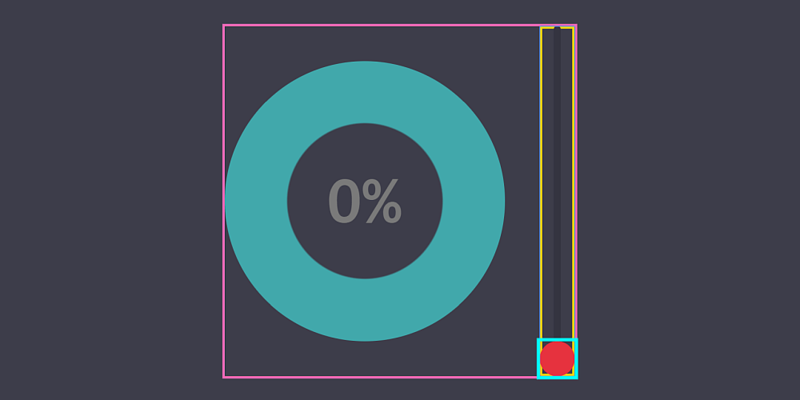 This means that when the slider value is at its minimum (which we haven't set explicitly, so it's the default 0), the left edge of the thumb's boxes coincides with the left edge of the input (and with that of the track). Also, when the slider value is at its maximum (again, not set explicitly, so it takes the default value 100), the right edge of the thumb's boxes coincides with the right edge of the input (and with that of the track). This puts the left edge of the thumb one thumb width ($thumb-d) before (to the left of) the right edge of the slider (and of the track). The following illustration shows this relative to the input width ($track-w)—this is shown to be 1. The thumb width ($thumb-d) is shown as a fraction k of the input width (since we've set it as $thumb-d: $k*$track-w). The slider thumb at the minimum value and at the maximum value (live). From here, we get that the left edge of the thumb has moved by an input width ($track-w) minus a thumb width (thumb-d) in between the minimum and the maximum. In order to move the output the same way, we use a translation. In its initial position, our output is at the leftmost position of the thumb, the one occupied when the slider value is at its minimum, so the transform we use is translate(0). To move it into the position occupied by the thumb when the slider value is at its maximum, we need to translate it by $track-w - $thumb-d = $track-w*(1 - $k). The range of motion for the slider thumb and, consequently, the output (live). Alright, but what about the values in between? Well, remember that every time the slider value gets updated, we're not only setting the new value to the output's text content, but also to a CSS variable --val on the wrapper. 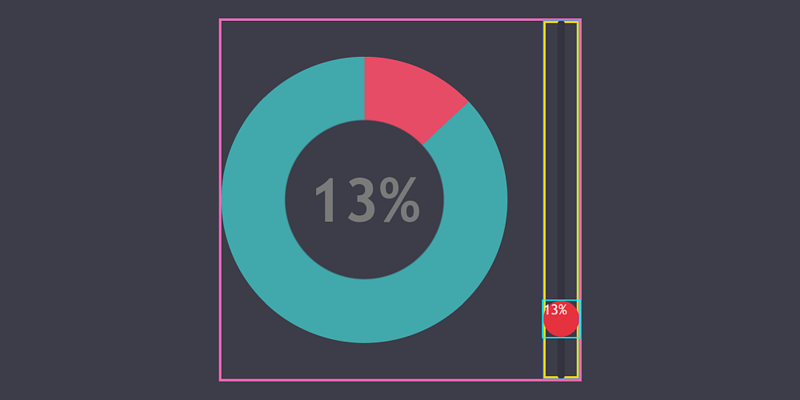 This CSS variable goes between 0 at the left end (when the slider value is its minimum, 0 in this case) and 100 at the other end (when the slider value is its maximum, 100 in this case). Note how the above works if we click elsewhere on the track, but not if we try to drag the thumb. This is because the output now sits on top of the thumb and catches our clicks instead. We fix this problem by setting pointer-events: none on the output. In the demo above, we have also removed the ugly outline on the output element as we don't need it anymore. Now that we have a nice fallback for browsers that don't support conic-gradient() natively, we can move on to building the result we want for those that do (Chrome/ Opera with flag enabled). Before we start writing any code, we need to clearly know what we're trying to achieve. In order to do that, we do a layout sketch with dimensions relative to the track width ($track-w), which is also the width of the input and the edge of the wrapper's content-box (wrapper padding not included). This means the content-box of our wrapper is a square of edge 1 (relative to the track width), the input is a rectangle having one edge along and equal to an edge of the wrapper and the other one a fraction k of the same edge, while its thumb is a kxk square. 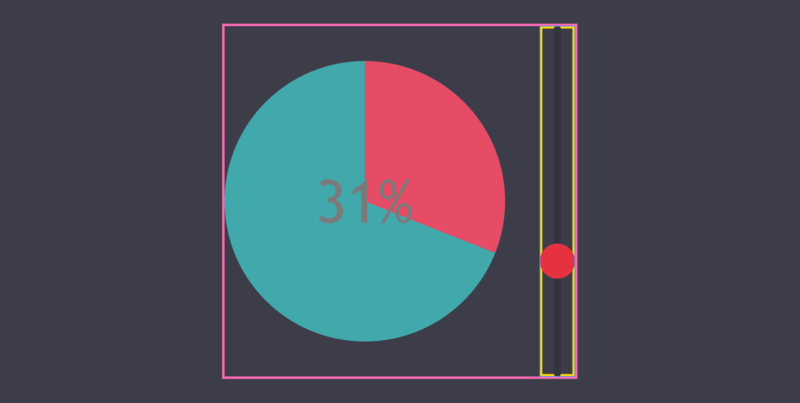 The desired layout in the chart case (live). The chart is a square of edge 1 - 2·k, touching the wrapper edge opposite to the slider, a k gap away from the slider and in the middle along the other direction. Given that the edge of the wrapper is 1 and that of the chart is 1 - 2·k, it results we have k gaps between the edges of the wrapper and those of the chart along this direction as well. The result in a first stage (live demo, only if we have native conic-gradient() support). This is a good start, as the output is already in the exact spot we want it to be. The "official" way of doing this for WebKit browsers is by setting -webkit-appearance: vertical on the range input. However, this would break the custom styles as they require us to have -webkit-appearance set to none and we cannot have it set to two different values at the same time. So the only convenient solution we have is to use a transform. As it is, we have the minimum of the slider at the left end of the wrapper and the maximum at its right end. What we want is to have the minimum at the bottom of the wrapper and the maximum at the top of the wrapper. 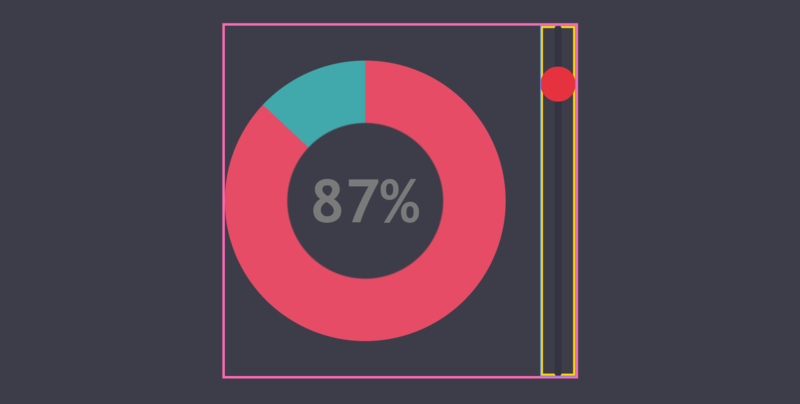 The initial position of the slider vs. the final position we want to bring it to (live). This sounds like a 90° rotation in the negative direction (as the clockwise direction is the positive one) around the top right corner (which gives us a transform-origin that's at 100% horizontally and 0% vertically). That's a good start, but now our slider is outside the wrapper boundary. In order to decide what's the best next step to bring it inside in the desired position, we need to understand what this rotation has done. Not only has it rotated the actual input element, but it has also rotated its local system of coordinates. Now its x axis points up and its y axis points to the right. The result in a second stage (live demo, only if we have native conic-gradient() support). Of course, the first step is to make it round with border-radius and tweak the color, font-size and font-weight properties. You may have noticed we've set the dimensions of the chart as (1 - 2*$k)*100% instead of (1 - 2*$k)*$track-w. This is because $track-w is an em value, meaning that the computed pixel equivalent depends on the font-size of the element that uses it. However, we wanted to be able to increase the font-size here without having to tweak down an em-valued size. This is possible and not that complicated, but compared to just setting the dimensions as % values that don't depend on the font-size, it's still a bit of extra work. The result in a third stage (live demo, only if we have native conic-gradient() support). The simplest way to emulate that hole in the middle where we have the text is to add another background layer on top of the conic-gradient() one. We could probably add some blend modes to do the trick, but that's not really necessary unless we have an image background. For a solid background as we have here, a simple cover layer will do. Alright, this does it for the chart itself! The result in a fourth stage (live demo, only if we have native conic-gradient() support). We do this with an absolutely positioned ::after pseudo-element on the wrapper. We give this pseudo-element the dimensions of the thumb and position it in the bottom right corner of the wrapper, precisely where the thumb is when the slider value is at its minimum. We also give it an outline just so that we can see it. The result in a fifth stage (live demo, only if we have native conic-gradient() support). Moving it along with the thumb is achieved exactly the same as in the no chart case, except this time the translation happens along the y axis in the negative direction (instead of along the x axis in the positive direction). In order to be able to drag the thumb underneath, we have to also set pointer-events: none on this pseudo-element. The result can be seen below—dragging the thumb also moves the wrapper's ::before pseudo-element. The result in a sixth stage (live demo, only if we have native conic-gradient() support). Alright, but what we really want here is to display the current value using this pseudo-element. Setting its content property to var(--val) does nothing, as --val is a number value, not a string. If we were to set it as a string, we could use it as a value for content, but then we couldn't use it for calc() anymore. Now the whole thing is functional, yay! The result in a seventh stage (live demo, only if we have native conic-gradient() support). The final look for the chart case (live demo, only if we have native conic-gradient() support). One thing that's nagging me is the fact that we have a bunch of common styles on the output in the no chart case and on the .wrap:after in the chart case. 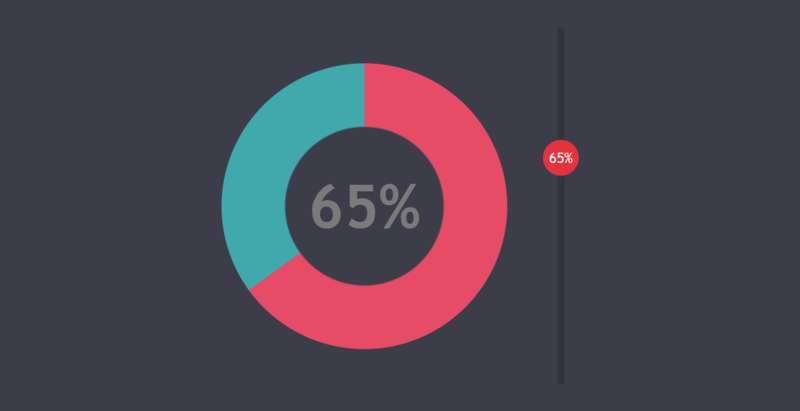 Styles on the output in the no chart case vs. styles on the .wrap:after in the chart case. Let's say we don't want to have that ugly outline on :focus, but we also want to clearly differentiate this state visually. So what could we do? Well, let's say we make the thumb smaller and a bit desaturated when the input isn't focused and that we also hide the text in this case. Sounds like a cool idea...but, since we have no parent selector, we cannot trigger a property change on the ::after of the slider's parent when the slider gets or loses focus. Ugh. The problem with taking this approach is that we're blowing up the font on the output itself, but for its ::before we need it to be the same size and weight as on the wrapper. We can solve this by setting a relative font size as a Sass variable $fsr and then use that value to blow up the font on the actual output and bring it back down to its previous size on the output:before pseudo-element. Other than that, we just move the CSS declarations we had on the .wrap:after on the output:before. Styles on the wrapper pseudo-element vs. on the output pseudo-element. Alright, now we can move on to the final step of differentiating between the normal and the focused look. The value on the thumb is only visible when the slider gets focus (live demo, only if we have native conic-gradient() support). The thumb is scaled down and desaturated as long as the slider isn't focused (live demo, only if we have native conic-gradient() support). The demo with a transition between the normal and focused state (live demo, only if we have native conic-gradient() support). While the browser support for this is still poor, the situation will change. For now it's just Blink browsers that expose flags, but Safari lists conic-gradient() as being in development, so things are already getting better. If you'd like cross-browser support to become a reality sooner rather than later, you can contribute by voting for conic-gradient() implementation in Edge or by leaving a comment on this Firefox bug on why you think this is important or what use cases you have in mind. here are mine for inspiration. Awesome article, Ana. Thank you for writing it! You mention CSS variables being critical these days. Are you referring to native CSS variables or preprocessor variables ? I always mean native variables when I say “CSS variables”. Otherwise, I’d just say preprocessor variables.